Like the look of this? Then arrange an appointment to see it in your home. Your advisor will bring our complete range to browse, measure up and provide a quote too. 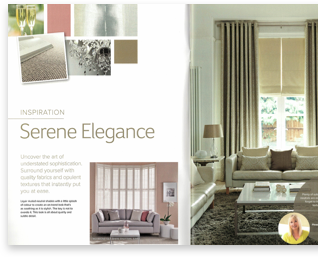 Sit back, relax and be inspired by our made-to-measure range of products in our brochure. A contemporary design that provides large, even curtain pleats. Available in 6 different colours. There are a number of header styles to choose from. Your advisor will help you get it right. This heading gathers the fabric for a luxurious feel. Speak to your advisor about the perfect header type for your chosen fabric. A decorative heading with pleats sewn in for a tailored finish. There are a number of header styles to choose from. Your advisor will help you get it right. Finish the look with cushions form Hillarys. Made to co-ordinate or contrast with your curtains. We've many beautiful fabrics to choose from with different sizes and piping available too. A feature in their own right, poles and finials add to the overall look and style of your curtains. All of our curtains are fully lined as standard. But choose a special blackout lining that helps stop sunlight getting in through windows. Perfect for your bedroom so you can instantly create a dark and sleep-friendly setting. All of our curtains are fully lines ad standard. Choose thermal curtains to keep your home warm and make it more efficient to heat. That’s because thermal curtains act as an effective insulating layer, stopping the warm air inside your home from escaping outside through the windows and large patio doors.